72% people prefer to receive promotional content through email. Email has the highest conversion rate (66%) when compared to social, direct mail and more. Email’s long-standing success, however, means that everyone is using it and inboxes are packed. Standing out from the crowd means innovating, testing, and creating the best email marketing campaigns your audience sees. There are lots of “how to” resources out there, and lists of tips for email marketing—and many are great resources. But sometimes a little bit of organic inspiration is what you really need to get the creativity flowing. Here are seven of the best email marketing campaigns we saw in 2016. Grammarly pulled a genius move when they paired a fan’s tweet with a relevant upgrade offer. For this email marketing campaign, Grammarly deferred to the social proof of a third-party endorsement—in this case, an embedded tweet. While leveraging a user’s cute Grammarly love letter, they also took the opportunity to offer a special, limited-time discount. Who says you can’t kill two birds with one email send? 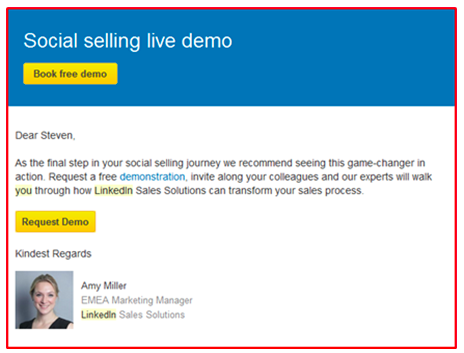 Social proof is just the latest iteration of word-of-mouth advertising. In fact, 88% of people trust online reviews written by other consumers as much as they trust personal recommendations. 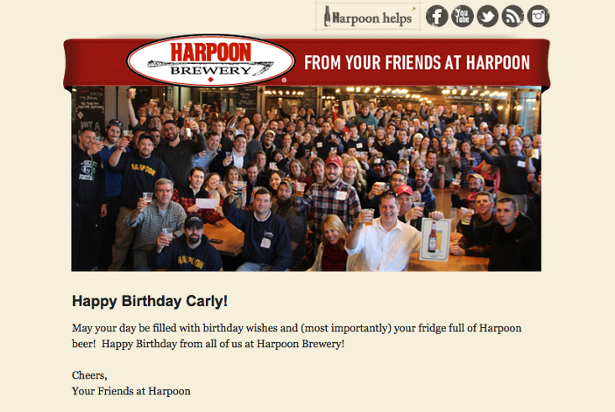 Combined with a scarcity message, this email send is a huge win. 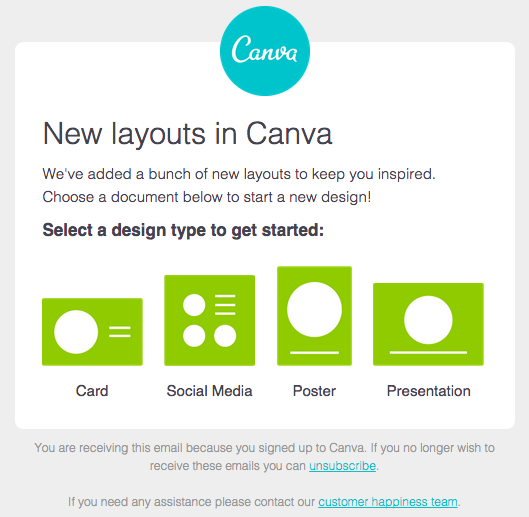 Craft starts by designing an email you actually WANT to look at. Though Invision has a well-defined audience of professional designers, every email marketer needs to give attention some to design—regardless of their industries. That said, there’s no need to commission the next Mona Lisa, and good design is not necessarily complicated. 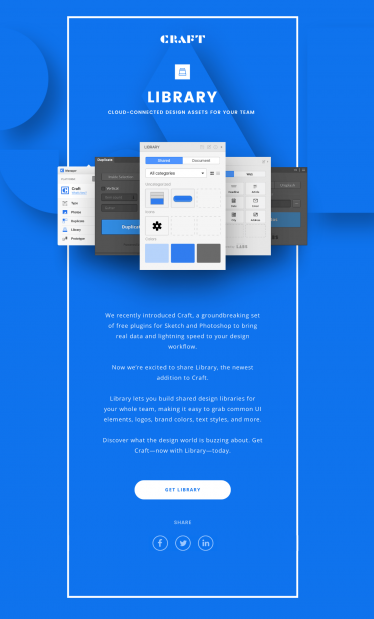 Craft’s email is beautiful in its simplicity and hyper-focused on one call-to-action (CTA). Maybe because a single CTA increases clicks by 371%, and sales by 1617%! Since, unfortunately, sometimes the most beautiful images on email campaigns get blocked by an ISP, make sure to use an ALT tag for each one on your campaign. It’s hard to think of anything more compelling than an email send with dancing tortilla chips. 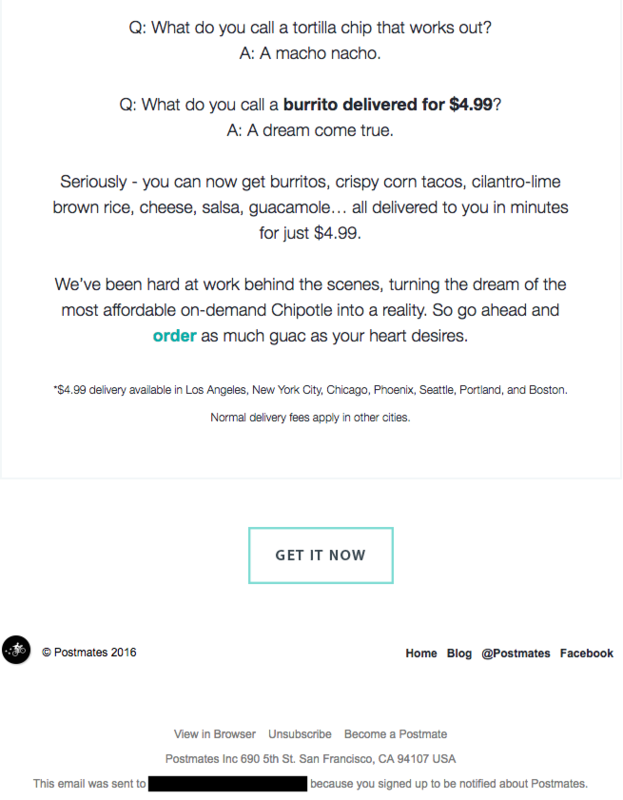 Postmates sends periodic emails attempting to activate or reactivate subscribers. They do this by offering free food giveaways in partnership with big brands (Panera, Starbucks, etc. ), as well as limited-time delivery specials. For this particular email send, they captured the reader’s attention with an enticing animated GIF of a Chipotle burrito bowl. True to their brand, instead of getting straight to the point, they take the opportunity to present a deal in an endearing way. The whole campaign is fun and mouthwatering—it would be hard to say no to if you were hungry at the office! Freshbooks has created a reputation as the champion of the small business owner. They consistently publish high-quality content on their blog for this target audience. 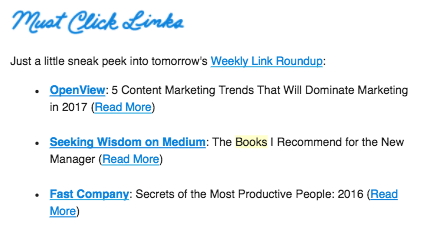 On a weekly basis, they share an email send with a roundup of their latest articles. 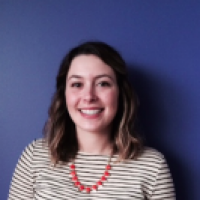 Personalize email elements that aim to create a personal connection.